I don't trust AI. The internet world is a fiction. What's important are the breath and heartbeat of life. Ryoken Kogami (鴻（こう）上（がみ） 了（りょう）見（けん） Kōgami Ryōken), known as Varis (Revolver in the Japanese version; リボルバー Riborubā) in LINK VRAINS, is the leader of the Knights of Hanoi in the Yu-Gi-Oh! VRAINS anime and the primary antagonist of the first season. Due to his role of leadership and his opposition to AI, he also serves as Yusaku Fujiki/Playmaker's main rival in the series. Full body view of Ryoken. Ryoken is a tall fair-skinned young man with lilac eyes and has white hair that spikes backwards at the sides, with purple-blue highlights, resembling that of Declan Akaba. On his right hand, he has a tattoo of a red triangle extending from the webbing of his thumb. He has at least two outfits, the first consisting of a white buttoned shirt and black trousers, while the second consists of a pink v-neck shirt underneath a light-grey suit jacket, with black trousers that end above his ankles. His eyes remained unrevealed until his identity was. Ryoken's avatar, Varis, in his initial appearance. 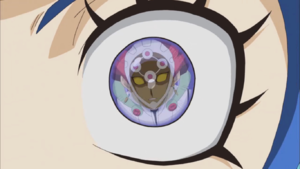 In LINK VRAINS, Varis is a tan-skinned man with yellow eyes without irises or pupils, and black hair with orange and red highlights. His ears are pierced with Egyptian-style earrings with a blue diamond and a gold bullet "token". Varis wears a mask with yellow glass and a white casing with a diamond-shaped pattern of white dots with red centers, linked together by a white circle that surrounds a white dot in the center of Varis's forehead that suggests the barrel of a gun. The visor of his mask can be covered with a dark lens to protect him from bright lights. Varis wears a white jumpsuit with a black elongated "T" shape tracing to the bottom of his chest, red ovals overlaying black ovals on the sides of the torso, and a v-shaped line of green where a belt would be. He wears a white trench coat lined with green with golden lines patterning both the inside and the outside of the coat. The sleeves are green white shoulder-pads and red diagonal bands on the bicep, making it unclear whether or not they are part of the jumpsuit or the coat. Varis also wears a small white mantle with a black line tracing around the middle, and a green ornament attached at the front on either side of his neck and at the back by red gems. Varis wears white-elbow length gloves with red diamond shapes on his forearm, and black boots with green heels and red patterns on the front that may be part of his jumpsuit. During the second season after rescuing Kyoko Taki, Varis changes his Avatar. While the overall form is largely identical to how it was previously, it does not mask his identity as much as it did previously; his visor peaks over his nose and his face beneath is unaltered, and his skin becomes sallow and his eyes become identical to his real ones. His hair turns silver, as in real life, and his highlights extend out from his mask and become orange, clustering at his temples. He retains the diamond pattern on his mask, but on a silver base diamond and becoming larger. His collar ornament becomes lime and fastened with red lines, and his coat and jumpsuit become white and black with lime accents. His gloves remain unchanged. Varis presents himself as stoic and calm, unshaken by setbacks and adversity, though he can still lose his cool. In the dub, this goes to the point of maintaining an even rasp, rarely raising his voice. Much like the other Knights of Hanoi, Varis is a ruthless individual that seeks Ai. He bears a great hatred towards the Ignis and the Cyberse world considering them a threat to the real world, and wanted to destroy them both, even using ordinary people to achieve their goals. However Varis claims that his actions are so that he can fulfill his promise to his father. Unlike most hackers, Varis distrusts Link VRAINS and the people that, to him, are dedicating their lives to it and make false relationships with other people. He values a person's life more. He distrusts Artificial Intelligence, to the point where he does not have one installed in his Duel Disk. Due to that, he looks down as on the internet world as false. 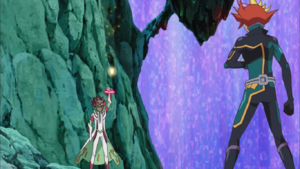 Despite his hatred towards VRAINS, Varis isn't against using the Cyberse for his own benefit. When Ai called him out on that, Varis described it as "counteracting poison with poison". During his Duel with The Gore, Varis claims not to despise someone as passionate as The Gore, but this does not earn them his mercy. Varis shares a number of parallels with Yusaku Fujiki; including a generally stoic front, an intense hatred of an enemy group, and a habit of listing out three reasons for his observations, although he doesn't do it as frequently as Yusaku. He even uses similar strategies, such as when he intentionally lowered his LP during their first Speed Duel in order to use "Storm Access". While Dueling, with loads of personal confidence, Varis tends to belittle his opponents and lower their guard. He claims to be cold-hearted when he Duels. "Varis" is a Latin name that means "bow-legged"; it is also possibly a corruption of the word "virus", invoking the term "computer virus", and bears some similarities to the Japanese name of the "Borrel" archetype; "Varrel". His Japanese alias of "Revolver" is a type of handgun; his "rokket" and "Borrel" monsters reference this. Varis can summon Data Storms at will. 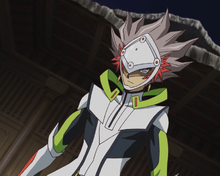 He is also a professional hacker and can even infiltrate the system of LINK VRAINS, stating he could even destroy it. He shares the same Skill as Playmaker, "Storm Access" which allows him to add a random Link Monster from a Data Storm to his Extra Deck when his LP are 1000 or less. Varis is also a cunning strategist, being able to predict his enemy's movements and lead them into a trap and counter them. Varis can also regenerate his body inside LINK VRAINS. A young Ryoken with Faust and Baira. Ryoken was a friend of Baira and Faust, and the latter considered Ryoken as his younger brother. Varis launched an attack on the Cyberse with three of his "Cracking Dragons". The Ignis were all sealed off and could not retaliate, except for one. This Ignis claimed he was their "savior", noting others had been trapped. Regardless, he promised to save all of them. Varis and the "Cracking Dragon" chased Ai, who escaped Cyberse and severed the connection to it, much to Varis's fury. Varis's "Cracking Dragon" devoured the Ignis, though his eye was lost in the network. Varis had his team search for the Ignis's remains, for only he knew the location of the Cyberse. Five years later, Spectre informed Varis that SOL Technologies' security were searching for the Ignis. Varis smiled, seeing that he could exploit the situation. He summoned Number 10, ordering him to capture the Ignis before SOL Technologies could, while dismissing Playmaker as a threat. He watched Number 10's attack on LINK VRAINS, and was intrigued when Playmaker arrived to challenge the Number 10, betting the Ignis on the Duel. To his shock, Playmaker used a Cyberse Deck; Varis had thought them destroyed. After Playmaker won the Duel, Varis admitted he didn't expect him to be that strong. Spectre arrived, explaining it was still better to let Playmaker have the Ignis than SOL Technologies. Varis knew that they were going to unmask Playmaker soon, noting that Playmaker hated the Knights of Hanoi, was one of few people that had Cyberse monsters and eventually would come and seek him out, as the leader of the Knights of Hanoi. Varis was nevertheless pleased, and actually wanted to prepare himself for the battle against Playmaker. Later, Varis sensed the location of the Ignis, and he flew over LINK VRAINS on "Borreload Dragon", but he was unable to track down the Ignis, as the connection was severed in the last moment. Varis returned to his base, displeased that he could not find the Ignis. He was approached by Dr. Kogami, who promised to make a new program, but needed more time. Varis stated that the ones holding the Ignis could not decipher him properly, but didn't want to give them too much time. Dr. Kogami said that they had to draw Playmaker out once more and defeat him properly. Varis heard an alarm, and logged off. In the real world, Ryoken approached his father, who was resting inside a pod. Ryoken promised he would make his father's wishes come true and tenderly touched his arm. Varis orders Blue Angel to use the Hanoi card. Varis was amused to see that Blue Angel wanted to challenge Playmaker, and Spectre claimed they could use her, giving her a "Dark Angel" card that was infected with a virus. During her Duel against Playmaker, Blue Angel fell in a trance and Varis told her she was a Knight of Hanoi, prompting her to activate the effect of "Dark Angel". Despite her use of "Dark Angel", Blue Angel was defeated. As he held the program capable of removing their virus from Blue Angel, Varis was certain that Playmaker would have to comply with his demands. Dr. Kogami told him that the Ignis had to be destroyed, though Varis was concerned about his father as he designed the Ignis. Kogami told Varis it was a painful decision to destroy the AI, while Varis reminded him of the importance of destroying the Ignis and the Cyberse. Varis summons the Data Storm to destroy the church. Akira Zaizen and Ghost Gal captured and interrogated Playmaker in a church within LINK VRAINS. Seizing his chance, Varis appeared before them and demanded that Playmaker be freed, as he was challenging him to a Duel. Zaizen refused, so Varis demonstrated his power by summoning a Data Storm and devastating the church. He threatened to destroy LINK VRAINS, but stated that was not his intention, since he was interested in the Ignis that Playmaker had in his possession. Zaizen refused to hand over the Ignis, so Varis revealed they had placed a computer virus inside Blue Angel as a hostage and only they had the ability to reverse it. Varis admitted that they could've placed the virus into anyone, but Blue Angel was the most efficient target to draw Playmaker out. Varis also knew that Zaizen, as the Security-in-Chief, had to take the Ignis back, but doing so would leave Blue Angel - Zaizen's sister - under the permanent effect of the virus. Thus, he promised to hand over the program if Playmaker defeated him. Hesitant at first, Zaizen freed Playmaker while Varis left to wait for Playmaker to come and Duel him. Varis faces Playmaker in a Speed Duel. As the two rode off on the Data Storm, Varis reminded Playmaker that he had interfered many times in the Knights of Hanoi's plans. Playmaker promised to defeat him and uncover their identities; Varis noted that he didn't care much for Playmaker's since they had many enemies. He declared their mission was to retrieve the Ignis and was surprised that Playmaker didn't know what an Ignis was. The Ignis promised to eat Varis's program and reclaim his body back, while Varis stated if he were to win, he would take the Ignis. Varis admitted he didn't bring his AI for his Duel Disk, as he didn't trust them, claiming the internet was a fiction. He valued the personal values of humans, and didn't trust the fake relationships and dedications in LINK VRAINS; in his words, such ignorance would destroy the world, as would the Ignis. He declared Playmaker his enemy for helping the Ignis, and caused LINK VRAINS to erupt into flames. Varis uses the Storm Access skill. Taking the first turn, Varis used "Dragonoid Generator" to Special Summon two "Dragonoid Tokens" and Tribute Summon "Cracking Dragon". He then summoned "Dragonoid Tokens" to Playmaker's field, using the effect "Cracking Dragon" to deal him damage. Despite this, Playmaker managed to turn the tables by Link Summoning three monsters and destroying "Cracking Dragon" with "Decode Talker", lowering Varis's LP to 1400. Despite having the advantage, Playmaker noted that Varis was vigorous and would not give up. Varis thanked Playmaker for clearing his field, as he brought out "Twin Triangle Dragon" and revived "Cracking Dragon", at the cost of it unable to attack and 500 LP. Varis sensed a power inside the network, and he summoned a Data Storm, revealing that he could use Playmaker's Skill; "Storm Access". Varis used all of his monsters to Link Summon "Topologic Bomber Dragon", a Cyberse monster that he found amusing to use against Playmaker's Cyberse monsters. He triggered the effect of "Topologic Bomber Dragon" with "Dragonoid Generator", destroying all monsters in the Main Monster Zones to lower the ATK of "Decode Talker" low enough to destroy in battle, then activated the second effect of "Topologic Bomber Dragon" to inflict its ATK to Playmaker, claiming that Playmaker had lost this Duel. Varis obtains his father's card. 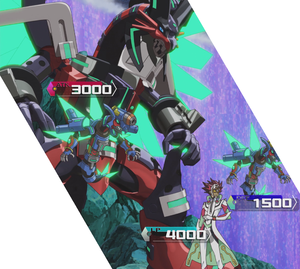 To stop the effect, Playmaker activated "Link Restart", and revived "Decode Talker", prompting Varis to comment on their resistance. Playmaker had the Ignis conjure a Data Storm, as Varis had expected them to do. Varis was impressed when Playmaker successfully used Storm Access, considering how mighty the Data Storm was. Playmaker attempted to Link Summon, but Varis used "Remote Rebirth", to revive Playmaker's "Capacitor Stalker" to a zone that "Topologic Bomber Dragon" pointed to, triggering its effect to destroy all the monsters in the Main Monster Zones, and thus the effect of "Capacitor Stalker", which dealt 800 damage to both players and ended the Duel in a DRAW. The force of the Data Storm then drew Varis and Playmaker into its eye, just as Varis had planned. Varis declared the place to be their new stage of battle, as a shining card Dr. Kogami sent to LINK VRAINS was added to his Deck. Varis explained they would have a Master Duel, fitting for them to show off their Link Monsters' prowess. Varis took the first turn, playing defensively with "Fire Prison" and "Linkbelt Wall Dragon" to make it harder for Playmaker to Link Summon and attack. During the Duel, he learned that Playmaker had named his Ignis "Ai", and he criticized him for giving it a name and not knowing what it was. His defenses successfully fended off Playmaker's "Encode Talker", though Playmaker assembled monsters for a new Link Summon. Warning Playmaker that his strategy would cost him, Varis Link Summoned "Triple Burst Dragon" despite being able to summon "Topologic Bomber Dragon", and attacked Playmaker's "Backup Secretary" instead of "Encode Talker". Playmaker was able to fend off the attack and minimize the damage that he took, and he summoned "Decode Talker" on the next turn to take out "Linkbelt Wall Dragon". 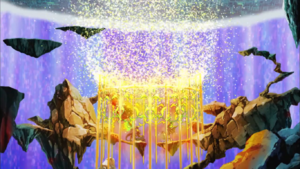 Varis had anticipated this, and he used the effect of "Fire Prison" to negate every Cyberse card as if it didn't exist, causing "Encode Talker" and "Decode Talker" to vanish, and even make Ai disappear. Varis's "Fire Prison" is destroyed by its own effect. 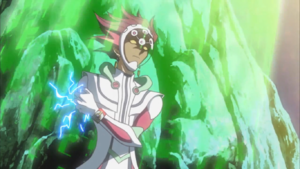 Varis claimed that it was Playmaker's fault for listening to Ai that had made the Cyberse cards unusable. He explained the history of the Ignis to Playmaker, explaining that they were AI with free will who were trying to conquer the network. Playmaker did not believe Varis, but Varis was unconcerned and noted that the most important thing was to capture and destroy Ai. Varis used the effect of "Triple Burst Dragon" to summon more Dragons and bring out his ace, "Borreload Dragon", attacking Playmaker directly and depleting most of his LP. Varis believed that he had broken Playmaker, but Playmaker stood back up, denying that the Cyberse were gone, as he could hear their pulses. He used his two "Code Talkers" to Link Summon "Firewall Dragon", which Varis realized was the card that Playmaker had obtained from the Data Storm. "Firewall Dragon's" summoning destroyed "Fire Prison", and it also destroyed "Linkbelt Wall Dragon", much to Varis's frustration. He fought back using his "rokket" monsters in combination with "Borreload Dragon", taking control of "Firewall Dragon" in an attempt to defeat Playmaker with his own Cyberse monster. Playmaker was able to destroy and revive "Firewall Dragon", and brought back "Encode Talker" the next turn, claiming that their real Duel had only just begun. Playmaker's "Firewall Dragon" used its effect to return Varis's monsters to his hand, but "Borreload Dragon" was protected by its own effect, forcing Playmaker to target and trigger "Magnarokket Dragon", whose effect almost destroyed "Firewall Dragon", though Playmaker was able to save it, much to Varis's amusement. Playmaker began to counterattack with his "Battle Buffer" Continuous Spell Card, raising the ATK of "Firewall Dragon" and "Encode Talker", impressing Varis. Varis countered with the effect of "Borreload Dragon", destroying "Encode Talker". Believing that Playmaker had run out of attacks, Varis claimed the match was over, but Playmaker revived "Decode Talker", whose ATK was increased enough to attack "Borreload Dragon". Varis countered with "Borrel Cooling", destroying his other "Magnarokket Dragon" to allow it to destroy "Decode Talker". Varis smiled, believing that he was close to victory, with Playmaker having no cards nor attacks to execute. Playmaker refused to lose, and claimed he wanted to uncover the events that had happened ten years previously, to recover the time he had lost and wanted to save the person that saved him. Varis was surprised to learn that Playmaker was aware of the Lost Incident and that he highlighted his speech with the same "three reasons" format that Varis himself used, but he claimed Playmaker was a fool to help SOL Technologies without knowing the truth. Varis is defeated by Playmaker. Varis flees from the scene. Playmaker refused to listen, and he had "Firewall Dragon" attack once more to perform a One Turn Kill. The attack destroyed "Borreload Dragon", and Varis was blasted into a rock as his LP fell to zero. Ai went wild, transforming into a giant form and attempting to devour Varis. Varis lost an arm, and he quickly fled the scene, relinquishing the program that would remove Blue Angel's virus. Before he left, he warned Playmaker that as long as he had an Ignis, their battle would continue. Varis returned to his base and Dr. Kogami expressed surprise at how Varis let his guard down, seeing it was about that incident Playmaker spoke. Varis regenerated his arm, apologizing to his father, and claiming that next time would be different. His father stated that Varis didn't need to think of that, and seeing how they could not retrieve Ai, they would execute their other plan, but he needed time to make preparations for that. Varis nodded, and recalling Playmaker's speech pattern of three points of analysis, he wondered about his connection towards him. 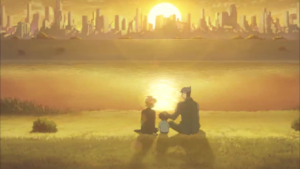 Varis and Kogami went to a deep pit where Kogami showed him a seed shaped like a cube, which would grow into a "fruit" that would destroy the whole network, including LINK VRAINS. Varis watched Kogami release the seed, which fell into the pit. After his father left, Varis remained at the pit, and he remarked the battle for humanity would begin soon enough. 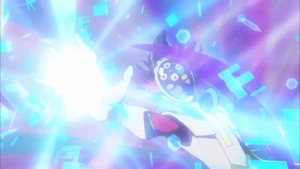 Ryoken holding the flashdrive containing the footage of Yusaku. As the Deleted victims were being infected, Varis was worried if the Hanoi program was activated, the Lost Incident records would be deleted, and he'd never uncover Playmaker's identity. He was contacted by his father, who reported the Hanoi program would soon be finished. Varis was still sad, as he wished to settle things with Playmaker. He told he wouldn't move on until he defeats Playmaker, and his father permitted him the rematch, as long as it didn't take too much time. Later, Varis watched as the Knights of Hanoi forced people to Duel, preventing them from logging out. Varis was unamused, considering a thousand people that joined the Knights of Hanoi were mere grunts, who wanted self-promotion by opposing LINK VRAINS. He was visited by Faust and Baira, who informed him Dr. Genome was making his move, and gave him the Data Gale. After Baira released the virus-removal program and logged out, she appeared next to Varis, who punished her. With all three of his subordinates - Genome, Baira, and Faust - defeated and resting inside pods, Varis left his headquarters in LINK VRAINS. In the real world, at Kyoko Taki's apartment, Ryoken removed a flashdrive from its hiding place and looked at the video recording on it - Yusaku Fujiki and Kal Kolter in Baira's room witnessing Blue Angel defeating Baira. Ai appeared in the video and Ryoken smiled, as he learned that Playmaker was Yusaku. Varis was at the pit, and proclaimed the time has come that he would risk the fate of the humanity on the Tower of Hanoi. 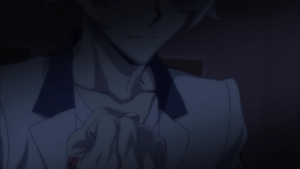 Ryoken looks at Yusaku, before proceeding with his plan. 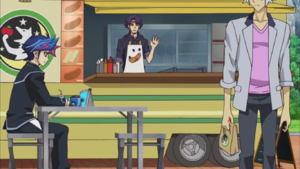 Ryoken visited Stardust Road, ordering food from the Café Nom food truck, his face still hidden. He told Kolter, who was still unaware of his true identity, that this would be the last time he would order from him. Kolter asked him if he was moving away; Ryoken replied that his reason was something like that before leaving. Varis returned to LINK VRAINS where he met up with Spectre, lamenting the loss of Dr. Genome, Baira, and Faust. He explained he was too focused on Playmaker. Despite this, Varis told the three were the core for his plan. Spectre asked if Varis was fine with the fact that they still didn't know Playmaker's identity. Varis proclaimed the plan had to resolve, even if it cost him his life, promising to defeat anyone that stood in his path. Later, he met Ghost Gal at the reprocessing plant, and was surprised to find her there. Varis noted Ghost Gal was snooping again, who promised to leave. However, Varis raised the barrier, stating he can't let her leave this place. Ghost Gal used the rope to reach a different exit, but Varis barred her. Ghost Gal asked Varis what would he do with her after she would be captured, suspecting she would be in trouble. Varis offered her a Duel to shape his Deck out, allowing her to leave if she would win. Ghost Gal attempted to leave, but Varis pointed out logging out was disabled. Thus, being forced to fight, Ghost Gal initiated her first turn in the Speed Duel. Varis applied his swarming tactics to bring out monsters to his field. Ghost Gal noted Varis did not bring an AI for his Duel Disk, as Varis stated trusting an AI is foolish. Ghost Gal remembered Varis spoke that Ignis would destroy the world, but Varis ignored her, considering her as a mercenary that would not understand that. Ghost Gal reminded herself of Varis's ace, and noted the longer the Duel lasted, the more she would be at a disadvantage. Varis quickly brought out "Topologic Bomber Dragon", as Ghost Gal sensed Varis wanted to quickly end the Duel. Varis's dragon attacked Ghost Gal's "Altergeist Marionetter". To prevent this, Ghost Gal played "Altergeist Kunquery", and sealed off the dragon's effects. Ghost Gal questioned Varis about the energy sphere, and Varis simply replied something unimaginable was bound to happen. Ghost Gal brought out "Altergeist Primebanshee" and Kidolga". Her "Altergeist" monsters attacked Varis directly, dropping his LP to 400, and even took Varis's "Twin Triangle Dragon" to defeat him. Ghost Gal gloated in her victory, but Varis called her a fool. Playing a Trap Card, Varis blocked the attack by destroying all of Ghost Gal's Link Monsters. Ghost Gal realized Varis could've simply played his card earlier to avoid damage, and all of that was just so he could activate his Skill. Varis mocked her for not being able to predict that, while Ghost Gal returned her "Altergeist Marionetter" to her hand. Varis smiles, having lead Ghost Gal into his trap. Varis uses his Trap Card to prevent his defeat. Activating his Trap Card, "Mirror Force", Varis destroyed all of Ghost Gal's Link Monsters. To prevent Varis from using his Skill, Ghost Gal activated her, Skill, Secret Cure, to at least raise Varis's LP. Much to her displeasure, she drew the 0 ATK "Altergeist Kunquery". Varis continued mocking her, stating luck has abandoned her. Ghost Gal planned her strategy to deal with Varis's effects and attacks, by using "Altergeist Protocol". Varis simply set Ghost Gal's card off with "Red Reboot", at the cost of halving his LP for using it from his hand. He also let Ghost Gal set a Trap Card from her Deck, but she was unable to play any Trap Cards during his turn. Ghost Gal still hoped in having the LP and field advantage, but Varis mocked her, claiming only darkness awaited her, from which she could not escape from. Varis, after bringing out three dragons, used Storm Access, taking out a Link Monster from the Data Storm, emitted from the purplish sphere. Varis Link Summoned his new monster, "Topologic Trisbaena", and revived "Defrag Dragon" at the position of former's Link Arrow. "Topologic Trisbaena" banished away all of Ghost Gal's Trap Cards and dealt her 1500 LP damage, and attacked her directly. Ghost Gal screamed, as she was defeated. Varis confronted Playmaker, who demanded to know Ghost Gal's whereabouts. Varis simply proclaimed she became a foundation for the Tower of Hanoi, which was activated. He stated should Playmaker wish to stop it, he'd have to confront him. With the purplish sphere emitting tentacles that destroyed the place, Varis jumped away. Varis responded to Kitamura's calling, who asked to speak with the Knights of Hanoi's leader. Kitamura was startled to meet Varis, who threatened to erase Kitamura if he wasted his time. Kitamura pointed out there was no media reporter around, and since they were alone, he wanted to propose a secret deal. Kitamura proposed an alliance to rule LINK VRAINS, amusing Varis. Kitamura knew the Knights of Hanoi have the control of LINK VRAINS, and he explained he would maintain their domain, thinking they could even earn a fortune. Varis was intrigued, but in order to have Kitamura join them, he had him undertake a test. Varis went away, leaving Spectre to face Kitamura in a Master Duel. Playmaker, on the other hand, hates Varis for being Hanoi's leader and vowed to defeat him and discover his true identity. During their first Duel, Varis claimed that he wasn't interested in Playmaker's identity and considered him to be just another of the many people who hates Hanoi. However, during second Duel, Varis recognized Playmaker's speech pattern of listing out three reasons and was disturbed when Playmaker mentioned about a certain incident that happened ten years ago. He chides Playmaker for siding with SOL Technologies without knowing the truth and, after the Duel, is eager to uncover Playmaker's true identity, to the extent of requesting more time from his father before the completion of Hanoi's program. A young Ryoken with Dr. Kogami. Dr. Kogami is Ryoken's father. He cares for him as he tends to him while he is comatose and promises to complete his ambition. Varis with his "rokket" monsters and "Borreload Dragon". Varis uses a "Rokket" Deck, which also features other DARK Dragons. His overall strategy centers on swarming the field with the effects of his Dragon monsters in order to assembles the necessary Tributes or materials to Summon his ace monsters and overwhelm his opponents through sheer force with their high ATK; many of his most powerful monsters commonly have 3000 ATK. Varis is a flexible Duelist who can shift strategies between Duels, making him an unpredictable opponent. His Skill, "Storm Access", plays into this; when he has 1000 or less LP, Varis can acquire a Cyberse Link Monster from a Data Storm and add it to his Extra Deck; all of these monsters have been the "Topologic" series. Initially, Varis uses the Knights of Hanoi's signature monster, "Cracking Dragon", to debilitate the opponent through its ability to repeatedly inflict effect damage. Even if this monster is defeated, Varis can use "Twin Triangle Dragon" to re-utilize it as material for his stronger Link Monsters like "Topologic Bomber Dragon", whose destructive effects can allow him to defeat his opponents after having their LP depleted by "Cracking Dragon". When utilizing his ace monster "Borreload Dragon", he switches his strategy to utilizing his "Rokket" monsters as literal cannon fodder for "Borreload", using their self-destruction effects in tandem with the effect of "Borreload" to permanently weaken a monster by 500 ATK and DEF in order to disrupt whatever strategy his opponent may have. 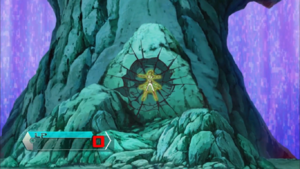 He is capable of performing an Extra Link; his "Topologic Gumblar Dragon" focuses on locking down the opponent while in this state. He also uses a number of cards to counter Link Monsters, such as "Mirror Force", as well as using "Fire Prison" to counter Playmaker's Cyberse monsters. A number of his Trap Cards are old staple cards released during the Yu-Gi-Oh! anime's run. During the second season, Varis includes Tuner, Synchro, and Xyz Monsters in his Deck. During his childhood, Varis played a Deck full of LIGHT Dragon monsters and Dragon support cards. A few of his cards were shown when he purposefully knocked into a young Yusaku Fujiki in order to mislead him into being kidnapped. Varis's English name was mistakenly initially stated to be "Varus" by Daniel J. Edwards. ↑ 2.0 2.1 2.2 2.3 Yu-Gi-Oh! VRAINS episode 12: "Link the Circuit"
↑ 3.0 3.1 3.2 3.3 3.4 Yu-Gi-Oh! VRAINS episode 9: "Malicious Mayhem"
↑ 6.0 6.1 Yu-Gi-Oh! VRAINS episode 3: "Contact"
↑ 7.0 7.1 Yu-Gi-Oh! VRAINS episode 8: "A Storm is Coming"
↑ 8.0 8.1 8.2 Yu-Gi-Oh! VRAINS episode 10: "Eye of the Storm"
↑ 10.0 10.1 Yu-Gi-Oh! 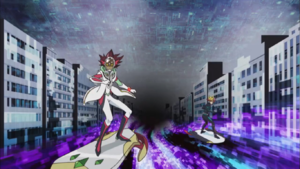 VRAINS episode 1: "Link into the VRAINS"
↑ Yu-Gi-Oh! 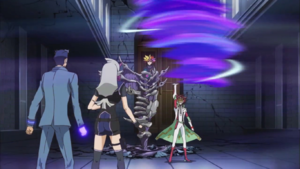 VRAINS episode 22: "The Deleted"
↑ Yu-Gi-Oh! 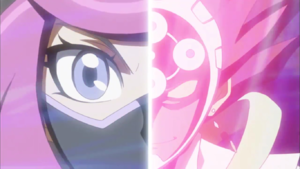 VRAINS episode 29: "Kolter's Khronicles"
↑ Yu-Gi-Oh! VRAINS episode 30: "Under VRAINS"
↑ 21.0 21.1 Yu-Gi-Oh! VRAINS episode 31: "A Ghost is Lost"
↑ This card is obtained via Storm Access in episode 9. ↑ This card is obtained via Storm Access in episode 31. ↑ This card is obtained from his father in episode 10.